Background: The BEACH programme provides a full-day, interactive course on Extracorporeal Membrane Oxygenation (ECMO) training. The course uses a variation of theoretical presentations, practical and simulation sessions presented by an international faculty. 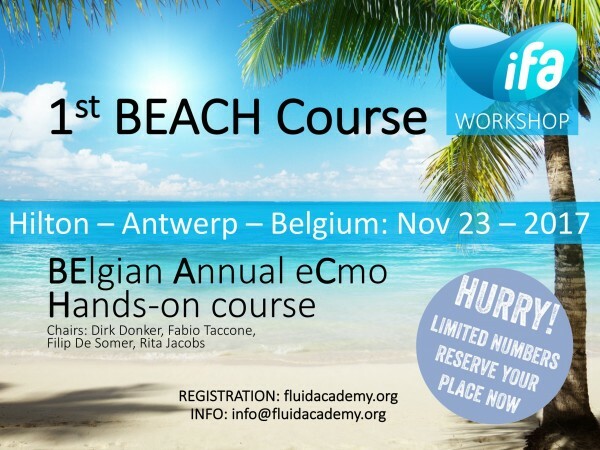 It is the only course in Belgium to be endorsed by the International Fluid Academy and has also been accredited by the EACCME for 9 points. The course is inclusive of all course materials, food and drinks at the Hilton Congress and Conference Centre, Groenplaats in Antwerp, Belgium. Delegates will have opportunity to meet, greet and ask questions regarding all topics presented.